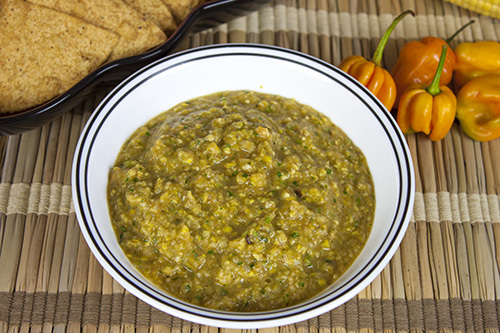 The combination of roasted corn kernels, tangy tomatillos and fiery habanero peppers mingle to achieve a salsa with a depth of flavor. Leave it covered in the refrigerator overnight to allow the flavors to develop even further, and enjoy. 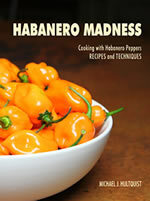 Remove the stems from habaneros and jalapenos. Slice in half lengthwise. Place on a lightly oiled baking sheet skin side up. Peel and clean the tomatillos. Slick in half lengthwise. Place on the baking sheet skin side up. Slice tomato in half and place on baking sheet skin side up. Peel onion and slice in half. Set on baking sheet. 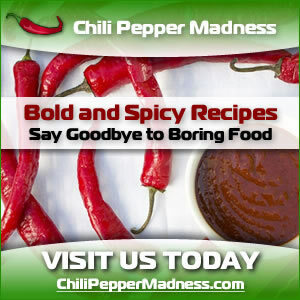 Bake 15-20 minutes or until pepper skins begin to char. 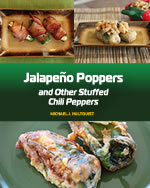 Peel skins from tomatillos, tomato and jalapeno peppers. Transfer all roasted ingredients to a food processor. Transfer to a bowl and cover. Refrigerate about 4 hours to allow flavors to mingle, or overnight to a deeper flavor.